In 2016, th+a began organizing key stakeholders in the Cedars Area neighborhood in order to discuss Planned Development 317 which had been created by Dallas City Council 27 years earlier. In 1989 PD 317 was established and was generally bounded by Interstate Highway 30 on the north, Interstate Highway 45 on the east, the G.C. & S.F. Railroad right-of-way on the south, and the M.K. & T. Railroad right-of-way on the west. The Cedars Area Plan (2002) established the future land use, urban design, and circulation vision for the area bounded by R.L. Thornton Freeway, Julius Schepps Freeway, the DART Railroad, and the Union Pacific Railroad. 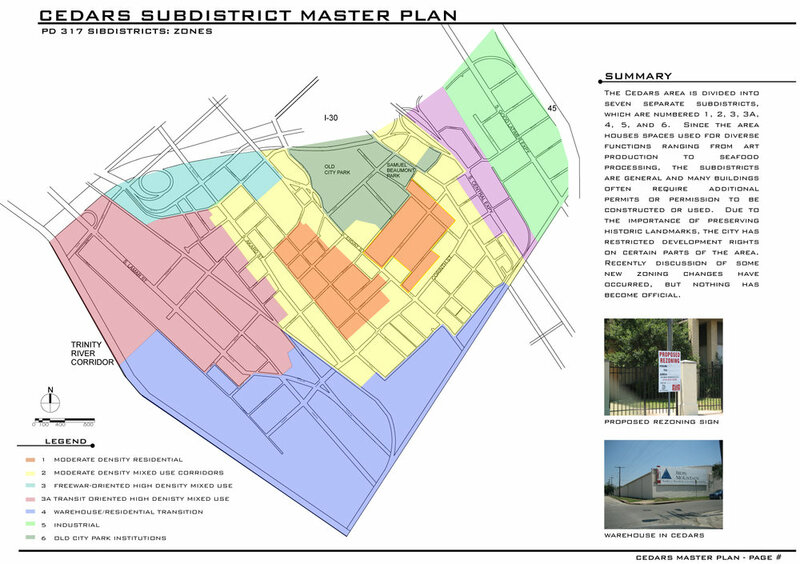 It provided the basis for rezoning the area to amend Planned Development District #317. After several meetings and workshops with neighborhood meetings that focused on the current maps and area definitions, the stakeholders made significant changes to acceptable uses within PD317 and made minor modifications to the mapping. The Dallas City Council authorized the opening of the PD in order for the city to work with neighborhood residents on the proposed changes. This work is still continuing.